As mentioned in the last post, Abbot Steve now receives regular medication injections and is able to “dose” himself as needed. This is a relief for all of his caregivers and, once again, we give thanks for the wonderful care he is receiving from Petaluma Hospice and, in particular, his doctor Steve Hadland and lead nurse Cynthia Clarkson. During last week's hospital stay at a visit to the on-site chapel, Lane was recognized by hospital chaplain Joé Annette Lille of Stone Creek Zendo, who offered words of comfort. When Steve woke up later that day, he found a beautiful card of the old gatehouse altar at Tassajara made by Peggy Denial and signed by Joé. It sits in his bedroom now. "We are the beneficiaries of such tender mercies," says Lane. 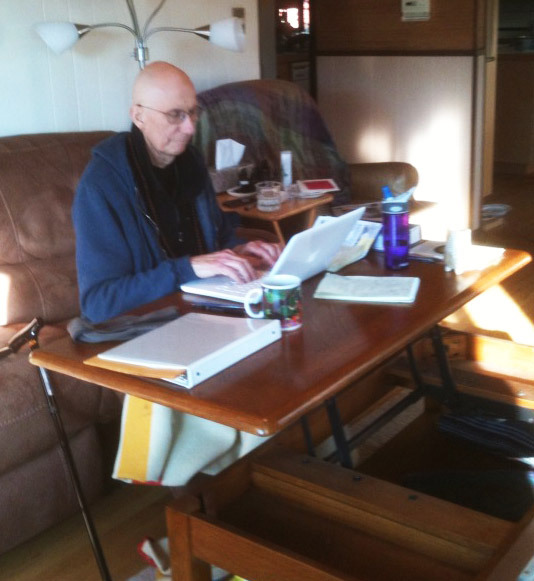 As his mobility has declined, Abbot Steve has found a way to set up an office in the living room where each day he keeps up with communications, as he is able. Tonight he will skype with the annual Dharma Eye Zen Center Solstice Party in Marin County. He and Lane are sending solstice greetings to all in the ten directions. Posted in Uncategorized on December 12, 2013 by Jay Pennington. So relieved to hear that the pain is mitigated. And inspired by the upright body and mind in the photo. 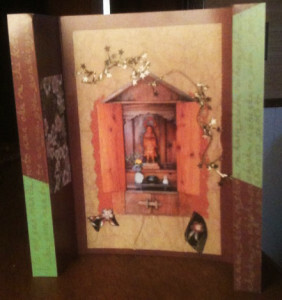 How wonderful that Skype can bring the sangha together for the solstice. In such sadness, many blessings. Deep bows to all. Steve, I think of you so often these days and am grateful for Subtle Eye for letting all of us know how you are. I offer morning incense to my Backyard Buddha for your well being and in gratitude for your teaching. Steve, your practice is a steady candle in this world, as always. I hold you in my thoughts and heart. So glad you are able to continue to take care of this wonderful life. I'm sitting in a Tea Shop in Toronto. Delicious pierogies - eating them here despite buying them elsewhere. Particularly fine snow flakes this morning - the size of half dollar coins. Ming and I enjoy the local Thich Nhat Hanh sittings. Love to you, love to your whole family! We have only met a few times but I found your warm, genuine, compassionate presence very uplifting and joyful. Thank you so much and may you feel as much ease and joy as possible in the face of your illness. dear sir, you're so brave. i don't know you but i'm crying over what's happening in your life. at the same time, you make me realize that it's possible to be graceful and present and maintain peace in my own situation, as you do in yours. you're an inspiration, thank you for offering your experience to benefit others. god bless you. i'm praying for you.